Inspired by my recent dining experience at Lucques, I decided to revisit Suzanne Goin’s recipe for Grilled Skirt Steak & Artichoke-Potato Hash with Olive Aioli. My prior attempt was less than stellar, not the least of which was the use of artichokes in oil and a tepanade instead of aioli. Given more time, this should be simple, right? Well, this attempt involved fresh artichokes, which are now in season. Unfortunately, the stores (yes, plural) that I visited had huge artichokes, not the baby versions called for. My basic approach was: get 2 big ones instead of 6 baby ones. An artichoke splinter and a hacked “fuzzy choke” later, I decided frozen artichokes would do! My next challenge was making the aioli. The first time I tried this with only an hour to make the hash, I simply punted and bought a black olive tepanade. This time, I wanted to faithfully create the aioli so I dutifully bought grapeseed oil, measured it out, separated the yoke and put it in the stainless steel bowl. Suzanne’s recipe says to add the oil “drop by drop, as slowly as you can bear.” Because I’m not Shiva with 4 arms, I thought I could cleverly hold the bowl and add the oil with the same hand while whisking with the other. Unfortunately, my motor skills caused me to immediately splash a tablespoon or more into the bowl all at once and I never got the oil to emulsify. I would have been better off dredging the Gulf of Mexico! (Breathe, Clark, breathe.) With the manual whisk route sabotaged, I put the mixture into the Cuisinart, reasoning that it’s whirling dervishness would create aioli par excellence…um, no. It was merely oily liquid that reminded me of a salad dressing without the vinegar. But, necessity is the mother of invention and creme fraiche was the stand-in base and actually worked well and saved time. Wish I had seen this video on aioli! At this point, the previously baked potatoes were ready to be crisped and browned. I have to say that simply crumbling the potatoes was liberating. Normally, my German heritage and observation of my Dad making stuffing drive me to precise hashing and uniform cubes of potatoes, which cook up faster than baked whole spuds. After the artichoke and aioli debacle, the rest fell neatly into place. 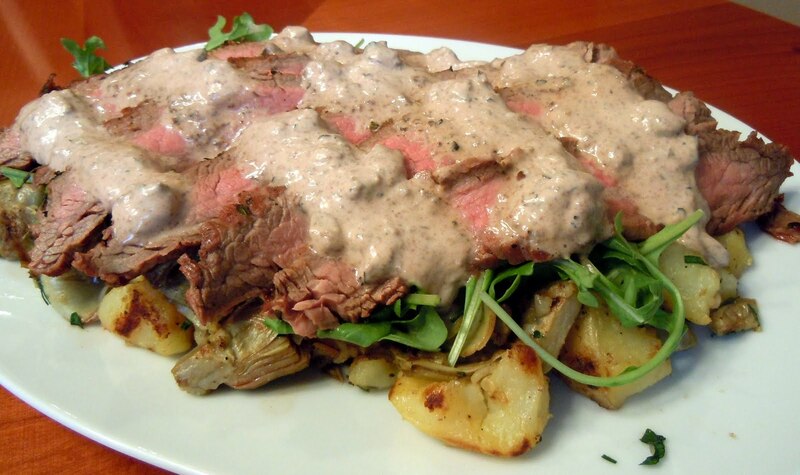 Grill the steak, sautee the potatoes and artichokes together, plate the potato and artichoke hash, top with arugula, slice the steak, put it atop the arugula then add faux aioli. Voila! This sumptuous hash takes some planning, but the results are truly stunning and make a great dinner hash. I paired mine with a Bridgeport Hop Czar because the imperiousness of the label’s czar helped me tame this hashcapade! I hope you enjoy the adapted version. > Rub steak with herb mixture and chill for at least 4 hours and prep next sections, then return to this step after artichokes, potatoes, and creme are done. 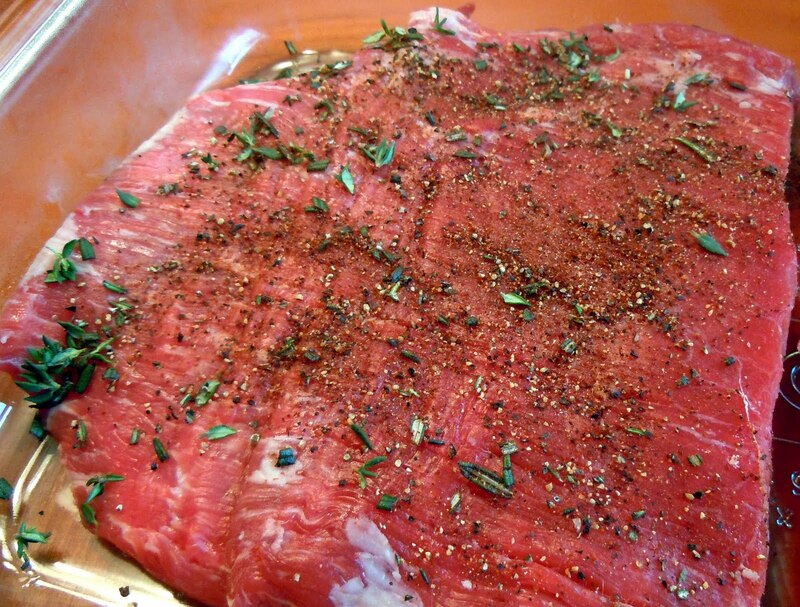 Salt generously and grill steak on high heat, 4-5 minutes each side or until medium rare, let stand 5 minutes before slicing against the grain with a diagonal bias into thin strips. > Combine above in a roasting pan, sprinkle generously with kosher salt, cover with foil and bake at 400 for about 45-50 minutes, testing with a fork for tenderness. (While baking, prep next sections.) Remove and let cool. Set aside roasted garlic, squeezing it in a ramekin for the Finishing Touches below. > Combine creme fraiche, garlic and 1/2 the unchopped olives in a mini food processor or blender and pulse until smooth. Add the chopped olives, lemon juice, cayenne pepper and season with salt and pepper. Set aside. > Crumble the potatoes into bite-sized chunks, while the pan is heated back to high, adding olive oil and waiting a minute. Add potatoes and season with thyme and a generous pinch of salt and pepper, letting one side crisp, then toss to get the rest of the potatoes golden brown. 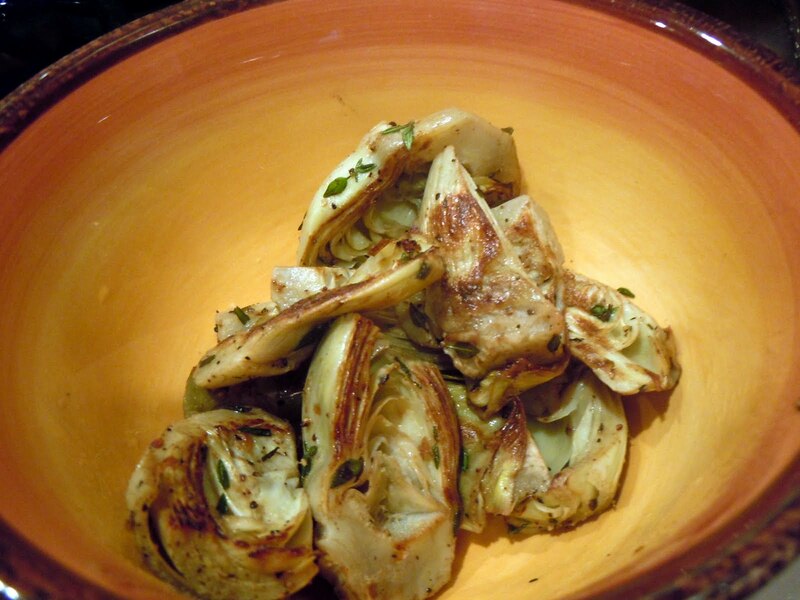 > Reduce heat to medium, add shallots, artichokes, roasted garlic, and butter, tossing the mixture well and heating up the artichoke, about 4-6 minutes. Stir in parsley and remove from heat. > Arrange the potato-artichoke hash on a platter, cover with arugula, layer the steak on top and drizzle the creme all over, reserving the rest for the table. If you’re a fan of LA Confidential, then you’ll appreciate the nod to iconic symbols of Los Angeles – the Hollywood sign and the view from Mt. Hollywood of Griffith Observatory and LA. If you’re a fan of trivia about all things LA, then perhaps you’ve come across it’s original name: El Pueblo de Nuestra Señora la Reina de los Ángeles del Río de Porciúncula. Mercifully, we have the hipper and cooler sounding LA and LAX to help us avoid dusting off our rusty Spanish! Speaking of hip and cool, I spent spring break in LA and enjoyed a lovely dinner at Lucques in West Hollywood where Suzanne Goin creates amazing dishes. What does this have to do with hash? As alignment of the stars would have it, her book, Sunday Supper’s at Lucques, contains a recipe for Grilled Skirt Steak with Artichoke-Potato Hash and Black Olive Aioli, which I’ve made in the past. Knowing that LA appreciates hash meant that I could experience a hashcapade or two of my own, even if Lucques wasn’t offering it that night…sigh. The following morning after our sumptuous meal at Lucques, Lisa and I ventured out in the cool and rainy Santa Monica morning to find Huckleberry Cafe, a recommendation by my brother. I replayed Jon’s explanation in my head, “Their hash is more like a stew, but very tasty.” My brain, in dismay: “Huh? Is that legal to call it a hash then? 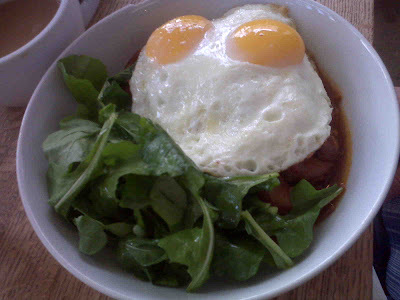 Does it count as a hashcapade?” After my mental dissonance subsided, I ordered the Niman Ranch Brisket Hash and happily tucked into the savory broth, tender brisket and potatoes with perfectly fried eggs. An arugula salad shared the stage with this hash production and almost stole the show! The corned beef arrived in a mini cast iron griddle and was actually a deconstructed hash. At the bottom was the ground corned beef with spices, two poached eggs in Hollandaise sauce, grilled asparagus and crisp shoestring potatoes with scallion garnish. The presentation was priceless! How was the hash itself? Very satisfying, but I missed the bigger bites of beef and potato that my rustic Niman Ranch hash had offered. I can say with extreme confidence Fig was far superior to my Hashcapade in a Can experiment! A couple of things about my obsession with hash. First, friends and family send recipes and restaurant suggestions, which I enthusiastically embrace. Secondly, I occasionally go on a bender, apparently lacking the good sense to deny myself. This post is about the latter, a double-header of hash goodness, a double hashcapade, a.k.a Double Trouble at Chez Clark! It all started out innocently enough as I read the upbeat e-mail from my nephew, Erik, suggesting a Red Flannel Hash (recipe further below). For the uninitiated, red flannel gets its name from the bright (I do mean bright) red color bestowed by grated red beats and red cabbage that resembles flannel cloth. See what I mean? Who knew iconic grunge wear tasted divine? Red Flannel Hash ingredients eagerly awaiting a transformation. Red flannel in a pan – who knew iconic grunge-wear tasted divine? I have to say that I was rather shocked at the resulting dish. My eyes, specifically the rods that sense red, were over-saturated to the point of possible damage – this was truly seeing red! However, my taste buds were pleasantly surprised by the sweetness of the beets in counterpoint to the cabbage. So this is what all the fuss is about – I totally get it! The bender part of this double-trouble hashcapade and its genesis may seem random, but I believe good food bloggers are interconnected in a web of culinary synergy. You see, I was checking out blog posts from Lindsay Strannigan because I wanted to make her Black Truffle and Chanterelle Risotto, Sadly, chanterelles are already out of season in Oregon and I wasn’t about to substitute dried mushrooms when black truffles were involved! But wait, her blog roll had Smitten Kitchen, which has recipes by season and I happily discovered Deb Perelman’s recipe – Spring Asparagus Pancetta Hash. Simple ingredients yield fantastic results. My favorite tool for asparagus is my trusty grill, which I use year-round. Paired the hash with a gruner veltliner from Austria – sehr gut! With the obligatory broken yoke adding yet more color. This recipe is a keeper – crunchy asparagus and pancetta, soft egg and firm potatoes – super easy! For those who think wine doesn’t go with hash, think again. According to WineMonger’s Easter post, the svelte white wine is the perfect complement to asparagus, peas and just about any spring vegetable. Cheers! Got other ideas for hash recipes? A tweet was the genesis of this morning’s pre-work foray to the Pearl, transporting me back in time to what I would imagine was a Route 66 diner. Earlier, I had composed a simple tweet: “Where should my next hashcapade be?” and immediately got a reply from @cocktail_diva: “Byways Cafe!” With expert advice recommending their Mt. Rushmore Hash, I walked through the door just after it opened and took in the wall of plates – stylized plates from all over the US *and* license plates. On the east wall, windowed cabinetry contained curated memorabilia from the 50s and 60s, maybe even earlier, and suitcases topped the shelves behind the counter! I plopped down in a red and silver upholstered booth, beneath the Wyoming plate and felt right at home. Observant readers will note that I’m a fan of music. Oldies were playing over the speakers – big band music, Motown and one of my favorite Beatles tunes – I’ll Follow the Sun. From my comfy chair (no one expects the Spanish Inquisition), I noted the green Hamilton-Beach milk-shake maker, an old Lucy & Desi poster and hand-written cards to mark the fresh pies and cakes that certainly must have tasted like heaven! The waitress was friendly as she took my order, disappeared, and returned impossibly fast with my coffee. An instant grin spread across my face when I read the cup…at least she was warning me! Mt. Rushmore is described as follows, “Home fried potatoes, hand-cut corned beef, onions and chunky bell peppers topped with cheddar cheese and one egg your way.” What the menu didn’t say was that you had better bring a posse, some ex-Presidents, or Adam Richman to tackle these mountain ranges of cheese & corned beef excess! Looking into the glass cases for inspiration, my eye caught a pamphlet for Yellowstone, another national treasure, which gave me the fortitude to do Wyoming proud and tackle my hash. Sadly, the hash won as I waved my white flag, packed the rest to-go, and called it a day…except I still had to go to work! So, where should my next hashcapade lead me? They say you can never go back to re-live a moment lost in time forever. In my case, it was a retro-hashcapade, an attempt to re-create the hamburger hash that my Mom used to make to sustain our large family. I remember sitting around a crowded table and eating all the potatoes first before I attacked the undefended hamburger to extend the meal as long as possible! 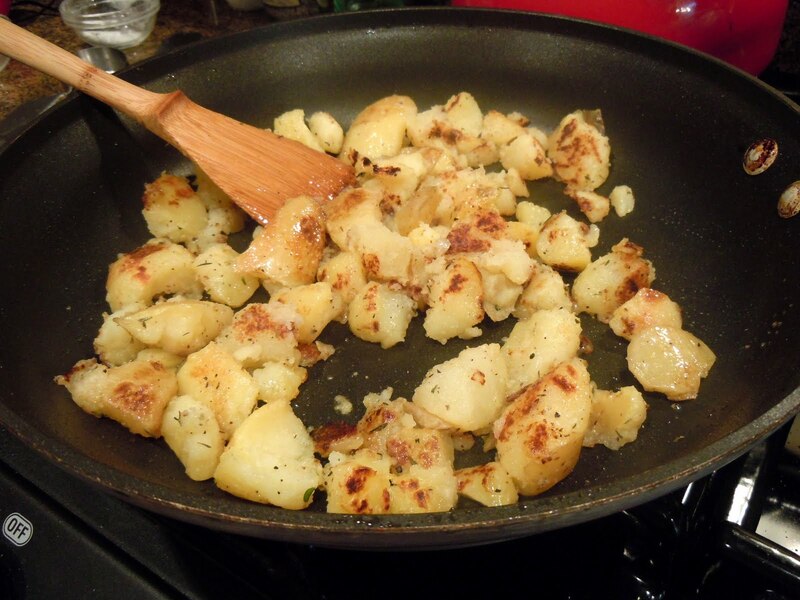 As for the creation of the hash, I vividly remember our big cast iron skillet cooking away with copious amounts of salt, some bacon grease, onions and hamburger, and diced potatoes from leftover baked potatoes. Cast Iron Skillet – Secret Weapon or Red Herring? Thinking the pan was the secret weapon, I busted out my cast iron skillet, pitted from past misuse and in desperate need of seasoning, but I didn’t have time. So, in went half an onion and a pound of organic hamburger. I boiled some potatoes in parallel for about 15 minutes, diced them, mixed in with the hamburger and voila, Retro Hamburger Hash! Would that it were a resounding success, but it tasted nothing like Mom’s. The store-bought hamburger was, well, pathetically small from being too finely ground and lacked mouth feel and body. As my brother would say, “It sucked scissors,” and at $6.99 a pound, I would say BIG scissors! Determined to reclaim my childhood, but interested in a gourmet version of this, I decided to make homemade ground beef. Several months ago, I bought an old-fashioned hand-crank meat grinder and Googled a few ideas for cuts of beef, ratios and grind. The results have been deeply satisfying – I know where the ground beef came from and the resulting dishes have been a quantum leap above store bought stuff – organic or otherwise – and cheaper per pound than organic wannabes. Next, I decided an earthy, mushroom flavor was in order and thought of a beef stroganoff I had made with sumptuous mushrooms in a thick, sauce that screamed umami. Once that idea took hold, I was off to the races with Yukon Gold potatoes bringing up the rear. The finishing touch was the creme fraiche and dill which provided creamy moisture and a touch of vibrant color. Umami-Laden Mushroom Mixture – Yum! After taking the first bite, I can honestly say this may beat my Smoked Salmon Hash. All the pieces came together in a rich, earthy, and satisfying melange with epic flavor! I hope you try this out and enjoy it as much as I did! Note: Potatoes can be cooked in parallel in a separate pan, if desired. I was cleaning up the meat grinder while the potatoes cooked!